Who remembers swimming lessons in Hartlepool? Children enjoying a trip to the baths. We are floating back to childhood memories of a day at the baths. We all have recollections of schooldays where we learned to swim and proudly received certificates for doing it. Taking a lesson at Seaton Baths. But who remembers these scenes from a day at the pool in times gone by? Did your school have its own pool or were you one of the pupils who had to take a bus trip to another venue? Who remembers that first step into the water but the delight of enjoying a warming drink on the way back home. Here’s some reminders of bygone days in the water. What was best about a day at the baths – and which bits were you not so fond of? 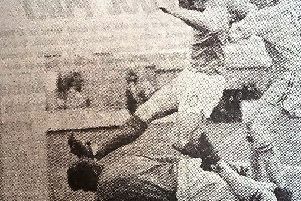 Or are there other aspects of Hartlepool nostalgia you would prefer to look back on. Seaton baths in a bygone era. St Cuthbert's School pupils having a lesson at Seaton Baths.